Meet Storm, a seven month old joey. Photo by Taronga Western Plains Zoo. 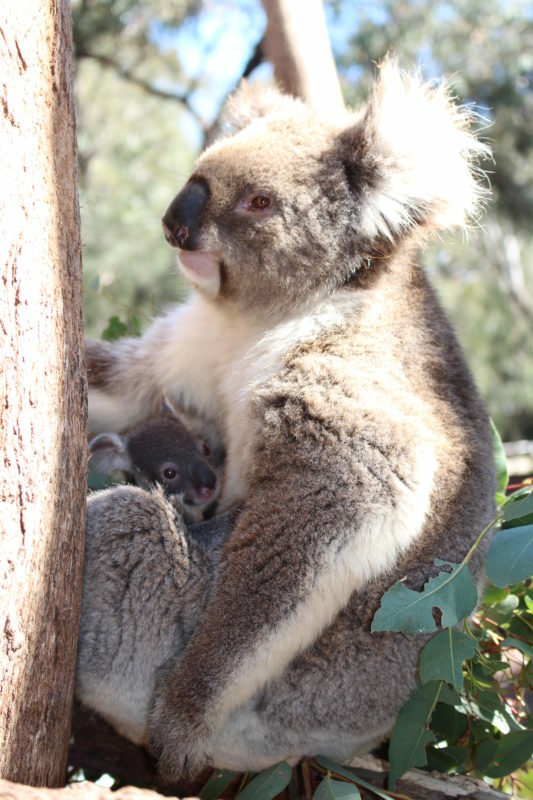 Visitors to the Taronga Western Plains Zoo in Dubbo, Australia delight in the new koala joey on view. 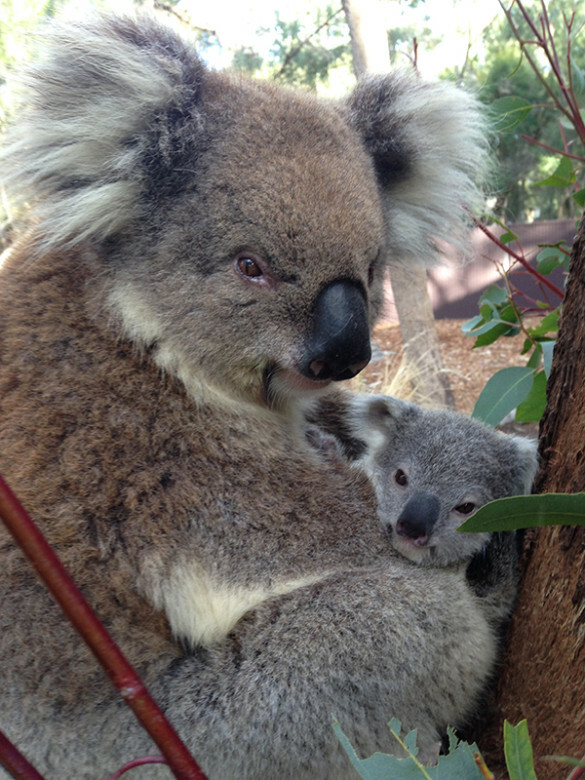 Named Storm, the seven-month-old joey is the first koala joey of the season to emerge from his pouch. This is the second joey for mother Wild Girl. Wild Girl came to the zoo’s wildlife hospital after she suffered a hip wound after being struck by a car and was unable to be returned to the wild. Storm with his mother Wild Girl. 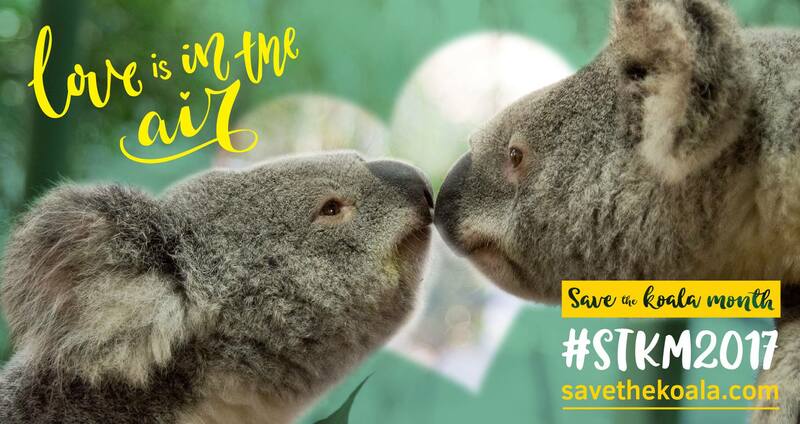 Photo by Taronga Western Plains Zoo. 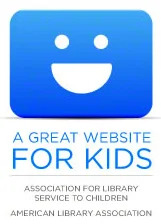 “Thunder is approximately seven-months-old, born in January 2015. Wild Girl is quiet protective of Thunder. He can be seen on the front of her chest for now but in the coming months will start to move on to her back,” said keeper Karen James. For more information about the koala joeys at Taronga Western Plains Zoo, visit www.zoofari.com.au. 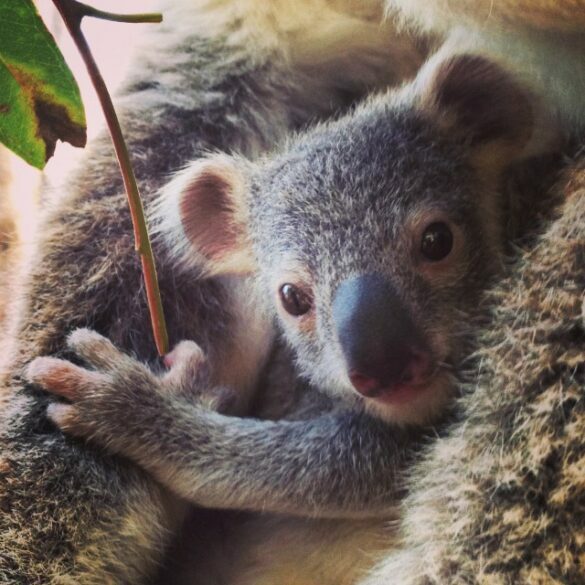 Say hello to Rosea, the baby koala who recently emerged from her mother’s pouch at the Taronga Western Plains Zoo. Photo by Natacha Richards, Taronga Western Plains Zoo. 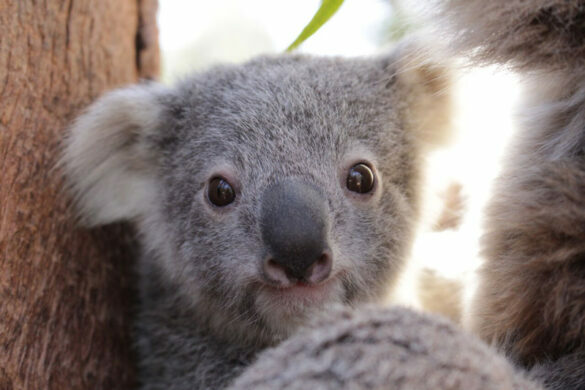 At the Taronga Western Plains Zoo in Dubbo, Australia, visitors got the first glimpse of a new fuzzy face! 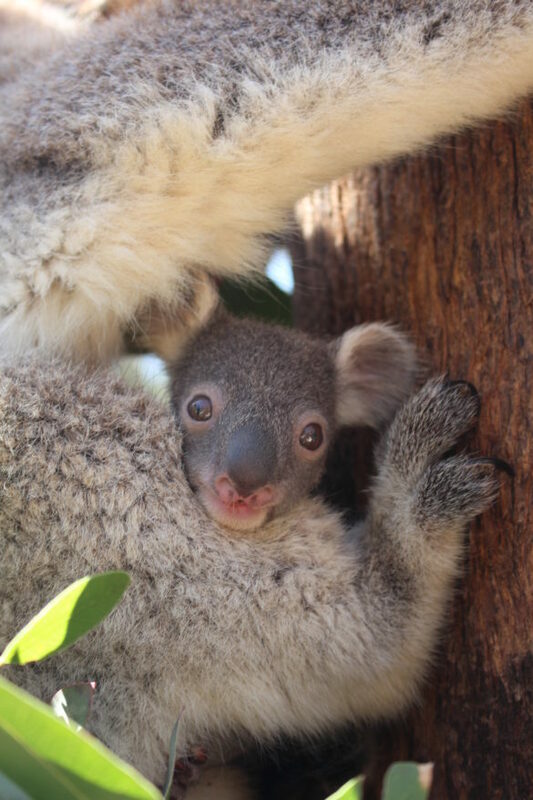 A female koala joey, named Rosea after a species of flowering eucalypt, emerged from her mother’s pouch. 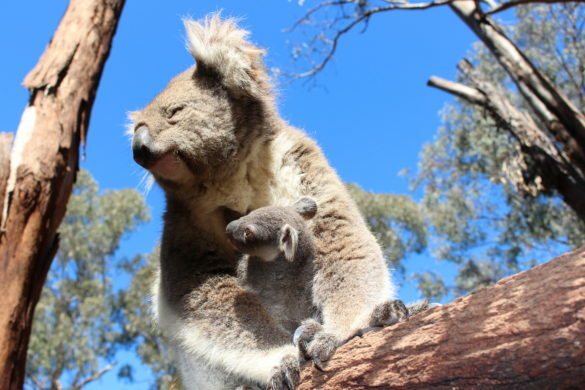 “Rosea is approximately eight-months-old and is a little shy at present, preferring to stay close to mum’s chest but in the coming months will start to move on to her mother’s back,” said keeper Natacha Richards. 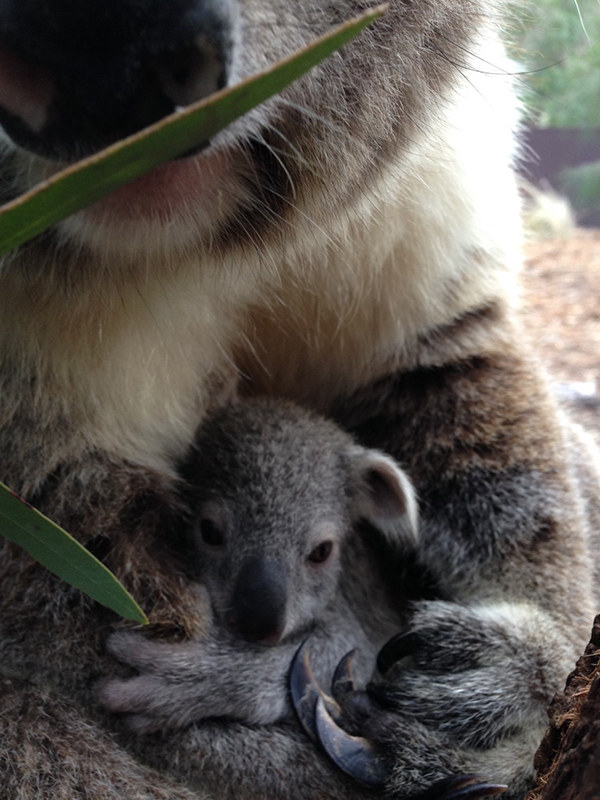 The zoo has two more koala joeys and many wallaby joeys that have yet to emerge from their mothers’ pouches. 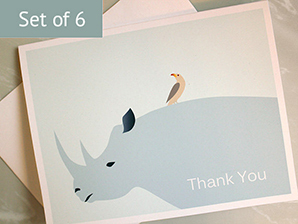 So visitors to the zoo will have a lot to look forward to! Photo by Jackie Stuart, Taronga Western Plains Zoo. Photo by Rachel Hanlon, Taronga Western Plains Zoo. Learn more about the koala joey at the Taronga Western Plains Zoo website. For more information about koalas, see our koala facts article. 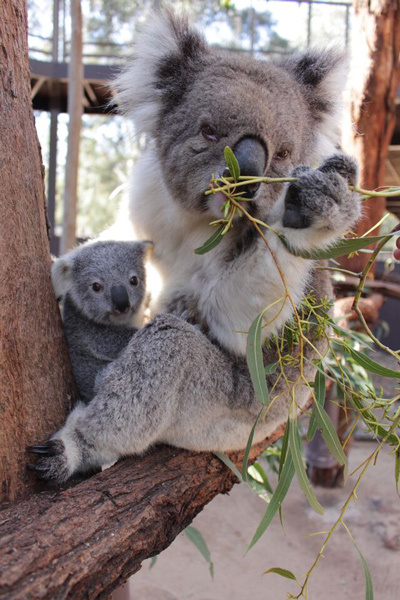 Koalas have special adaptations that enable them to feast on eucalyptus leaves. 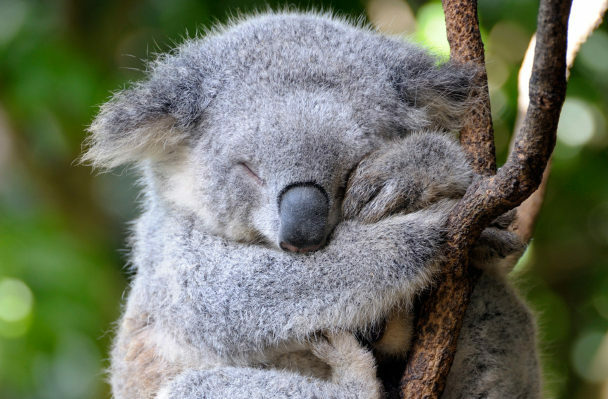 Eucalyptus leaves are highly fibrous and poisonous to other animals. But koalas have bacteria in their stomachs that break down the fiber and toxic oils and allow them to absorb 25% of the nutrients.